Looking for Railway Overhead Fitting ? Square Round Bar With rich industrial experience we are Supplier, Trader of square round bar, fabricated from quality examined raw material. Known for its top quality and stability, these bars are broadly utilized in differs in...With rich industrial experience we are Supplier, Trader of square round bar, fabricated from quality examined raw material. Known for its top quality and stability, these bars are broadly utilized in differs industries across the globe. We also meet customized requirement for our customers benefit. Metro Handle Black An excellent quality range of Metro Handle Black, our clients can avail from us. This range of Metro Handle Black is known for its best quality and durability. Clients can ava...An excellent quality range of Metro Handle Black, our clients can avail from us. This range of Metro Handle Black is known for its best quality and durability. Clients can avail from us this range of Metro Handle Black at most affordable prices. Hydraulic Track Jack (Dk-20) We are engaged in manufacturing and exporting excellent quality Hydraulic Track Jack (DK-20) in Kharkiv, Kharkiv, Ukraine. It is intended for hoisting and straightening of the railway track, switches durin...We are engaged in manufacturing and exporting excellent quality Hydraulic Track Jack (DK-20) in Kharkiv, Kharkiv, Ukraine. It is intended for hoisting and straightening of the railway track, switches during ballasting, as well as for works on reconstruction and repair of the railway track. Track Spike We are involved in offering excellent quality Track Spike to our most valued clients. Our offered Track Spike is widely appreciated by our clients which are situated...We are involved in offering excellent quality Track Spike to our most valued clients. Our offered Track Spike is widely appreciated by our clients which are situated all round the nation. We offer Track Spike at most affordable prices. GURU NANAK OVERSEAS CO PVT. LTD.
Railways are the cheapest mode of transport for traveling from one state to another. They are highly serviceable for both the passengers as well as for carrying goods. With such a major contribution of railways to the Indian economy, all the components and fittings required for the construction of the complete body, have their own significance. Many a manufacturing units of these components and fittings are continuously engaged in coming up with innovative products as per latest technology. One of the most important parts of a train is the overhead fittings which constitute the most important aspect of railways. What is an Overhead Fitting? Overhead Fittings are also known as overhead lines or overhead wires. 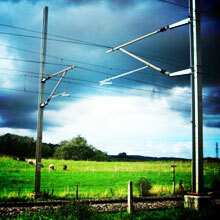 Before going into further details, it is important to know what is an overhead fitting or an overhead line. According to Wikipedia, Overhead lines are wires used to transmit electrical energy to trolley buses, trains and trams at a distance from the energy supply point. Overhead lines are used on the basis of one or two overhead wires situated above the railway tracks and raised to a high electrical potential by connection to feeder stations at regular intervals. These feeder stations derive electricity from high-voltage electrical grid. Electric trains receive electric current from overhead line system using several specialized devices such as Pantograph, Bow Collector or a Trolley Pole. These current collection devices are pressed against the underside of the lowest wire of an overhead line system known as acontact wire. The current collectors are electrically conductive, and allow current to flow through to the transformer of the train or tram, and back to the feeder station via the steel wheels and one or both running rails of the track. It is a form of train that uses electric rail cars sometimes used in streets. The term Light Rail was coined in 1972 by the U.S. Urban Mass Transit Association (UMTA) to welcome the appearance of new streetcar transformations which were taking place in Europe and the United States. The history of light rail can be delineated from the horse drawn street railways or a horse car which was drawn using animals like horse. Here the term 'light' is used to describe the light load and fast movement rather than its physical weight. The American Public Authority defines light rail as: "An electric railway with a 'light volume' traffic capacity compared to heavy rail". Also light rails are much more affordable than heavy rails. Heavy rail is entirely different from light rail and is used for regular railways. Heavy trains are those, the services of which we commonly use for the purpose of traveling from one state to another i.e. a normal passenger train. It is also used for loading and unloading goods. Since these trains are used for carrying passengers as well as freight, the curves and slopes are gentle. In countries like U.S., the term light rail is used to describe the metro systems but is different from commuter rail and inter city rail services. Before the 2nd World War, heavy rails existed in Boston, Philadelphia and Chicago. With the advent of the war, new systems were opened in other states of U.S such as Cleveland, Baltimore, Washington, the San Francisco-Oakland region, Los Angeles, Atlanta, and Miami. Today heavy rails is used in almost all the countries of the world including India. The above products are also used as overhead line equipments for Trolley Buses. Trolley Buses are simply electric buses which are run with the help of overhead wires from which it draws electricity with the help of two trolley poles. Trolley Buses use rubber ties instead of steel wheels on rails. These buses are easy to run on hilly areas as electric power is much more effective here than diesel power. Also they are very much environment friendly than other trains and do not make much of unnecessary noise. One of the disadvantages of a trolley bus is that if it is dewired, it is left stranded for hours without any power supply. Less number of power lines are also responsible for trolley buses not being used frequently. Equipments used in Trolley Buses are the same as those used in Heavy Rails but mainly cover Straight lines and curves and crossings and switches .